One of the great pleasures of a visit to Italy is to stumble across a local festival or fair (festa, sagre, fiera). Although there are a great many of these events - fairs, costumed festivals, patron saints' days etc. - so that your chances of finding yourselves participating by chance are good, it is nevertheless worthwhile to do a bit of research because some of these festivals are not to be missed - as a show to be viewed and/or an event to take part in. The festivals of Umbria are characterised by horseback events, flag throwing, and, notably, dressing up in Renaissance or Mediaeval costume, all of which are extremely popular in Italy, especially in Tuscany and Umbria, and have reached a very high level of professionalism. Entire villages sometimes deck themselves out in mediaeval gear for several days at a time for festivals in Umbria and Tuscany. In addition to the spectacle, there is invariably a good range of food available - indeed, very often the raison d'être of a seasonal fair is a particular harvest, game season, mushroom season, vendemmia, olive harvest and so on, with the food matching the occasion. 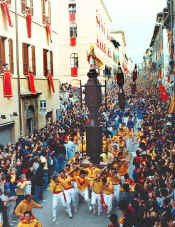 A famous palio, a spectacular run held every year on 15 , in which three teams, clad in the distinctive colours of yellow, blue and black, with white trousers and red belts and neckbands and devoted to S. Ubaldo (the patron saint of Gubbio), S. Giorgio, and S. Antonio, run up much of the mountain from the main square in front of the Palazzo dei Consoli to the Basilica of S. Ubaldo, each team carrying a statue of their saint mounted on a wooden octagonal prism, similar to an hour-glass shape 4 m tall and weighing about 280 kg. A crossbow competition dating back to 1410. The competitors are members of the crossbow clubs in Gubbio and Sansepolcro, who dress in Renaissance costume for the competition. The winner receives a banner made especially for the event each year by a noted artist. After the competition there is a procession through the town's torch-lit streets. There is also a display of flag-throwing, a popular activity in Italy. 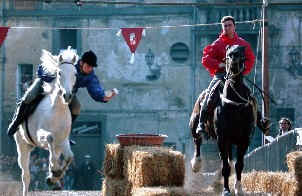 The corresponding event in Sansepolcro takes place on the second Sunday of September. This palio is a mediaeval joust that involves knights from the various city factions of Orvieto competing to win the Palio victory standard on 30 May from 9 pm onwards in Piazza del Popolo. Originally the joust was named the Corsa alle Oche and required each knight to charge his horse towards a couple of unfortunate geese hanging from a rope, whereupon he was supposed to take off their heads. Today’s tamer version has a white handkerchief in place of the geese, which the knight is supposed to grab and deposit in the appropriate basket. 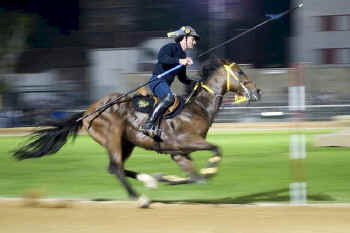 The joust in fact has two victory standards: the Palio di Contrada, which is awarded to the winning Contrada faction, and the Paliotto Individuale, given to the best knight. 30 May 4 pm – blessing of the horses and knights in Piazza Belisario and Piazza della Repubblica, 6 pm procession of the nobles of Cava and Pistrella, performance by the Gruppo Arcieri e Balestrieri di Orvieto, flag-throwing and music, 9 pm Piazza del Popolo joust for the assignation of the Paliotto, 9.30 pm procession in period costume, 10 pm Palio dell’Oca. The infiorate taking place on the Sunday after Corpus Domini (Corpus Christi), the ninth Sunday after Easter, is an unusual act of religious devotion, namely the creation of elaborate pictures composed using cut up flower petals spread along the streets of Spello. The entire town is carpeted in flowers and some of the compositions display remarkable skill. The Infiorate is competitive and awards are given to the teams in a number of categories. The tradition of flower petal compositions is relatively recent in Italy. 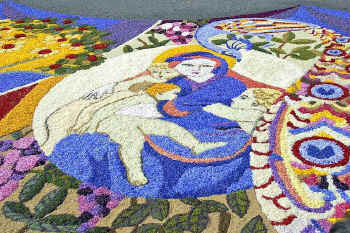 The famous Corpus Domini flower carpet celebration in Genzano, 30 km outside Rome, dates from 1778, and the Spello tradition began only in the 1930's but is now famous. Work is carried on throughout Saturday night. At noon on Sunday, the bells of the cathedral are rung and the Bishop sets forth to parade through Spello, piazza by piazza. Ferragosto is arguably the most important holiday in the Italian calendar. Its roots are Roman - probably pre-Roman - and linked to the middle of summer and the end of hard labour in the fields. During Christian times ferragosto became Ascension Day and commemorates the Assumption of the Blessed Virgin Mary into heaven. Almost all businesses except restaurants are closed. Families gather together for marathon meals, both at home and also at restaurants so reservations are essential. There are innumerable feasts and festivals on this day throughout Umbria and the rest of Italy. Here are a few taking place in Umbria (dates approximate). The event takes place from August 15 to the first Sunday of September in honour of Lucrezia Borgia with mediaeval dinners, tournaments, historical parades, conferences, concerts, cinemas, exhibitions. 15 August to the first Sunday of September. "Hunting the bull" with historical costumes, from 10 August to the second-to-last Sunday of the month. Spoleto Experimental Opera House di Spoleto "A. Belli"
From mid-August to early October. Festival of music and entertainment. Middle two weeks of August. Ceramics market, from 2 to 17 August approximately. Cooking race - the products of the race are eaten afterwards. 19 August approximately. Parade in costume, performances and challenges between districts.Mid-August. Evenings devoted to art, history, culture, tradition, gastronomy. Mid-August. Shows, cultural events, concerts, from 1 to 17 August.